Combined CI/HA systems, which AB refers to as using the Acoustic Earhook, Cochlear calls Hybrid CI, and MED-EL calls Electro-Acoustic Stimulation (EAS), promise to offer some of the advantages of both cochlear implants and hearing aids. These systems may not be available in all countries. Cochlear implants work by electrically stimulating parts of the cochlea. The innermost portion of the cochlea is difficult to reach with an electrode array because it is extremely narrow. This portion is responsible for the lowest frequencies. 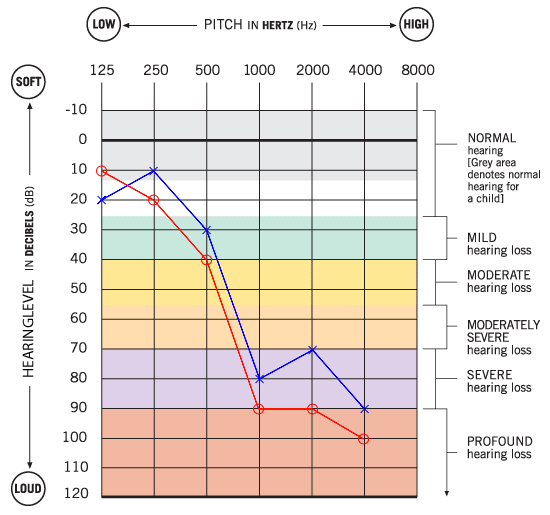 At the same time, ‘ski-slope’ hearing loss is fairly common. The loss is greater at high frequencies than at low frequencies. This audiogram shows a mild hearing loss at low frequencies, with a severe to profound hearing loss at high frequencies. A hearing aid can be used to boost the low-frequency losses. A high-power hearing aid may help with the higher frequencies, but a patient with this audiogram may be approaching the limit of being able to make use of a hearing aid. A cochlear implant can typically stimulate down to about 250Hz. Some people report a tinny sound quality with cochlear implants, although sound quality often becomes more natural over time (as reported by late-deafened adults). Combined CI/HA systems comprise a cochlear implant, augmented with a conventional hearing aid. The two are adjusted to work together, such that the hearing aid presents the low frequencies, and the cochlear implant presents the high frequencies. The internal electronics for CI/HA systems and conventional cochlear implants are identical. Because the hearing aid portion of the system needs to work with low-frequency hearing, it is important for that hearing to be unaffected by the implant surgery itself. Some electrode arrays are designed to maximize the chance of retaining low-frequency residual hearing. Techniques usually include making the electrode array very thin, controlling its shape, and including insertion tools and reference marks. Cochlear takes a different approach with the Hybrid L24 electrode, which contains the same number of electrodes as the conventional array. But they are closer together, and the array is shorter, so it does not get inserted to the area responsible for low-frequency hearing. While this makes sense intuitively, 44% of the clinical trial subjects who received this array suffered profound or total hearing loss after receiving the implant. See page 64 of Cochlear’s presentation to the FDA for further information. A CI/HA system can always be used as a conventional CI by disabling the HA functionality. With a conventional cochlear implant array, you will have the benefit of a fully functional cochlear implant if you lose your residual low-frequency hearing. If you lose your low-frequency hearing after having received a short array, the electrodes can be reassigned to the full frequency range. However, the electrodes don’t reach as low as those in a conventional array. If you are considering a combined CI/HA system, you may want to discuss with your doctor about the possibility of losing residual hearing, and about the different array options. May provide more low-frequency sound information. Built-in retention system in case the processor falls off the ear. Functions as a conventional cochlear implant if residual hearing is not preserved. Sound quality may not be the same as with a conventional array. A bit more cumbersome to put the processor on – first install the ear mold, then hook the processor on the ear, then put the headpiece on the magnet. May be less comfortable due to the ear mold.